Clinton Road is located in Passaic County. It runs in a north-south direction, beginning at Route 23 and running roughly 10 miles to Greenwood Lake. The road gets its name from the now-unseen settlement of Clinton, which was located about where the road crosses the brook. A man named Jiles Jones once lived along the unpaved stretch of Clinton Road. He was a cruel, evil man who valued his privacy and property. Jones was known for chasing trespassers off his property with a shotgun and his loud, intimidating, and mumbled threats. He would often chase down trespassers who had a car, dirt bike, or quad in his black pick-up for as long as it took them to get back into town before he turned around and headed back home. Several people, even to this day, described being chased down by Jones in their own cars; either after having driven down Clinton Road innocently or having purposely riled the old man. Jones lived in his little, ramshackle farmhouse for close to 30 years before suffering a mortal heart attack one morning while working in his fields. Jones had no family so his home, surrounding lands, and even his black pick-up sat abandoned for many years. Ownership of the property eventually reverted to the state, but they appeared to have no interest in doing anything with it. This is when the myths and legends began, after Jones’s death. They say that if you drive down Clinton Road during the darkest hours of the night and honk your horn three times, Jones will come chasing you down in his black pick-up truck and fire his shotgun out the window. It was later reported, and verified by several witnesses, that a group of rowdy teens, led by local troublemaker Roger Cavits, entered the local bar and loudly discussed amongst each other their intentions not to drive down Clinton Road and honk their horn and to spray-paint their initials on Jones’ abandoned black truck. The bartender at the bar verified this occurrence, even going so far as to warn the group to “leave it alone.” Roger dismissed the bartender’s warning and the teens left the bar. Jim Ford, a resident of Clinton Road (his house is situated in the more populated area of town, about two miles away from Jones’ former home), described the night that Roger Cavits and his friends were found in their car, which had been in a fatal crash. The sounds of a gunfire had awoken Jim from his sleep. When he stepped out onto his front porch, he witnessed Roger Cavits’ bright red Firebird speeding down the road, which was being pursued by a black-pick up truck. Jim admitted that he had seen white initials spray-painted onto the side of this black pick-up, and that the paint must’ve still been wet, as it was beginning to drip down in little rivers. The two vehicles vanished into the darkness, and Jim went to call the authorities about what he had witnessed, as something about the scene had not sat right with him. Hours later, Roger Cavits and his friends were found dead in Roger’s bright red Firebird. Strangely, the car had not run off the road or into a tree, instead it was found right smack in the middle of Clinton Road, smashed in on every side. The boys’ bodies had been so pulverized inside the car that bits of their flesh, bone, and blood had sprayed all over the other boys’ bodies. At Jim’s insistence, the sheriff drove over to Jones’ property to look around for anything suspicious. The sheriff spotted Jones’ old black pick-up truck sitting in its usual spot. The truck had been sitting there for so long that grass and weeds had breached the rotten bottom of the truck’s floor and were nearly touching the roof. The sheriff was nearly ready to discount Jim’s story, seeing as how the truck clearly hadn’t moved in years, when he saw fresh white spray-paint all over the truck’s rusted metal, the initials of the boys found dead in their car. More paint was found on the truck’s front bumper, but it wasn’t white spray-paint. And it wasn’t wet. It was bright red, and it had been caked into the bumper through heavy force. It was the same color as Roger Cavits’ Firebird. The cause of the crash and subsequent deaths of the boys were never solved, and most people in town won’t even speak of the incident. Some years ago there was a girl driving her blue 1988 Chevrolet Camaro down Clinton Road heading towards Route 23. As she picked up speed, she smashed into the cement divider on the sharpest turn of the whole road and was instantly killed. If you tell someone else the story while on Clinton Road, you will see some combination of her or the blue Camaro drive past you. There was a group of friends camping close to Terrace Pond near Clinton Road. In the early morning hours around 1 a.m., they were approached by two park rangers. The rangers were concerned about their fire and if they were drinking. The campers then asked if their cars would be towed or if they would receive summonses where they parked; the rangers informed them that they were fine and no tickets would be issued. When they went to their cars in the morning, they found two summonses on each car. West Milford police and Newark Watershed approached the camping group and the campers immediately told them of the two park rangers. The authorities were confused so they asked the campers to describe the ranger. The campers complied and were then informed that there were no park rangers patrolling the property anymore, and the two men they saw that night were killed on patrol in 1939. So if two park rangers approach you in the night on Clinton Road, be warned — they may be ghosts. One story that is not always brought up with Clinton Road are the cannibals living in the woods. They are known to dump large pieces of furniture like sofas and fallen trees into the road. In that instance, WHATEVER YOU DO, DO NOT GET OUT OF THE CAR! When the average person gets out of their car to investigate and or move the item out of the roadway they are kidnapped and eaten by the bloody-thirsty cannibals. So just know that they are lurking. No one is too sure how this legend came to be, but let me tell you — it is a spooky one. 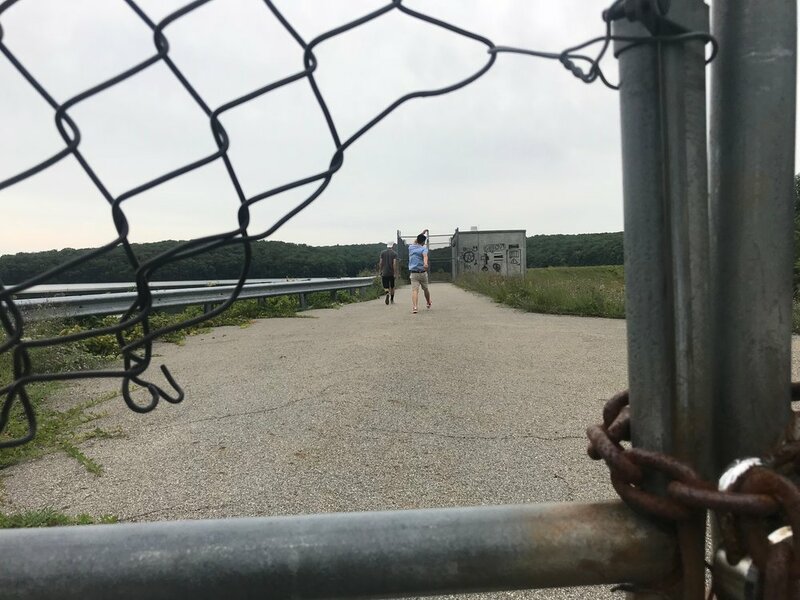 One rumor suggests that a boy was challenged by his friends to stand on the bridge as they drove to Route 23 and back. Unfortunately, by the time the friends returned from driving to the highway, they found their friend dead. It is known that if you stop at the bridge on Dead Man's Curve at around midnight and throw a quarter off the bridge, the quarter will be thrown back up and hit the road. Another suggests that a little boy was hit by a car and killed on the bridge when he went to pick up a quarter he saw on the ground. The legend is that if you get out of your car and stand on the bridge you will see a quarter drop, and if you bend down to pick it up the little boy will push you into the reservoir to save you from being hit by the car. Others account that after they threw a quarter off, not but a minute later they heard the bloop of the quarter hitting the water a second time, as if you dropped the quarter in again. The water filled with ripples and a child’s reflection appeared. This is all because the ghost of the boy is still lingering under the bridge. In 1983, a man on a bicycle was going down Clinton Road. On his ride he discovered a giant vulture, feasting at a spot in the nearby trees. He got off his bike to investigate and before he knew it he walked up on a dead human body. Later, an autopsy found that the man died of foul play. This body was quite strange due to the fact that there were ice crystals formed in his blood vessels close to his heart. All of his inside, organs, decayed at a much slower rate than his skin. The conclusion was that someone had frozen him after death to attempt to throw off the investigators. The legend has it that he hides in the woods in the cold of the winter, waiting to scare you. Ice man was not the only dead body found on Clinton Road, and I am sure that there are more undiscovered bodies. Once again this story involves a man riding his bike down Clinton Road and out of no where a giant bird suddenly flew out of the woods straight across the road. Obviously he was startled and stopped to investigate. He identified them to be vultures. He was curious as to why vultures were around; it typically means that something is dead and they are eating it. The man walked up on a bag and began to open it. He dropped that bag as fast as he picked it up. What he saw was a piece of a dead body; not just any piece or any body, but a human head. He abruptly went and found a police officer. An investigation was held, and it turned out to be a mob rub-out leading to a murder arrest. Another story involves a disappearing body. One night two people were driving on Clinton Road, merely just to get home. As they approached the curve near the middle of Clinton Road stretch, they saw a body bag. Many of you are probably wondering, “How could they see a body bag from the road?” Well, it was on the road. It was in the middle of the road and covered in blood. They immediately turned the car around and contacted authorities. The authorities found nothing, no bag, no blood, no body. It is a complete mystery still to this day. One Saturday night in the Chilton Hospital’s Emergency room something chilling happened. An ambulance brought in a woman out of her mind, kicking and screaming, with severe burns on her legs. She was high on heroin and claimed to be a witch. The nurse in the ER asked the ambulance driver where they had found her. He said, “Well, walking along Rt. 23 near Clinton Road, of course.” She was up there with people worshiping Satan when they decided to throw her into the fire. After the ER staff gave her something to bring her down from the drug high, she became violent — so violent that they had to tie her down with restraints. She was yelling things like, “My powers are too strong for you,” and “I’m going to crawl into your mind.” That is the end of the story. No one knows what happened to her after that. There are vicious, nasty animals lurking deep within Clinton Road. Some speak of a grey/white worth with red eyes just watching them and not attacking. Another says that they were chased down Clinton Road by a dog. Okay, a dog, not bad right. However, it was floating. A floating dog chased a car down to route 23. The scariest of them all is the hell hound sighting. There was a group of friends adventuring down the one dirt road off. They suddenly all noticed something approaching, the same thing, some sort of animal. They drove down the road going about 60, trying to get away from this animal. They got pulled over, and the animal disappeared. They concluded it to be the Jersey Devil or even a hell hound. Some animals aren’t as scary, but are strange. Such as reports of monkeys being seen. These are thought to be, if not supernatural things, survivors of the jungle habitat attraction. The Jungle Habitat was closed in 1976, and the animals could have been survivors or escapees and crossbreed in the wilderness. It's All True: Even though I have labeled all of those as "myths" many of the stories are not myths; in fact, most of them are true. However, every story does have exaggerations. The facts are that many dismembered bodies are found in the woods off of Clinton Road. The KKK does have gatherings there, and there is Satan worship. So all in all, if you're going to check out Clinton Road, be careful or else you will might end up featured in this spooky blog post. This took place in broad day light, which is what threw me off so much. My boyfriend, David, and I were adventuring down by the dam. There was snow on the ground so I would've heard crunching if there was a person there with us. As I turned around just to walk the other way, I saw a very bright figure, similar to the one in the third story listed, and it was moving very fast and as my eyes followed it another one appeared and disappeared before I even noticed it. I thought it was just my mind. So, I went back to walking around. Out of nowhere I heard this very faint scream, instantly turned around, and saw the figure again, but it once again disappeared. David claims he saw and heard nothing, but he was pretty far away. To this day, it is still a mystery to me. This did not take place in the dark, but in fact happened after my friend and I got home. 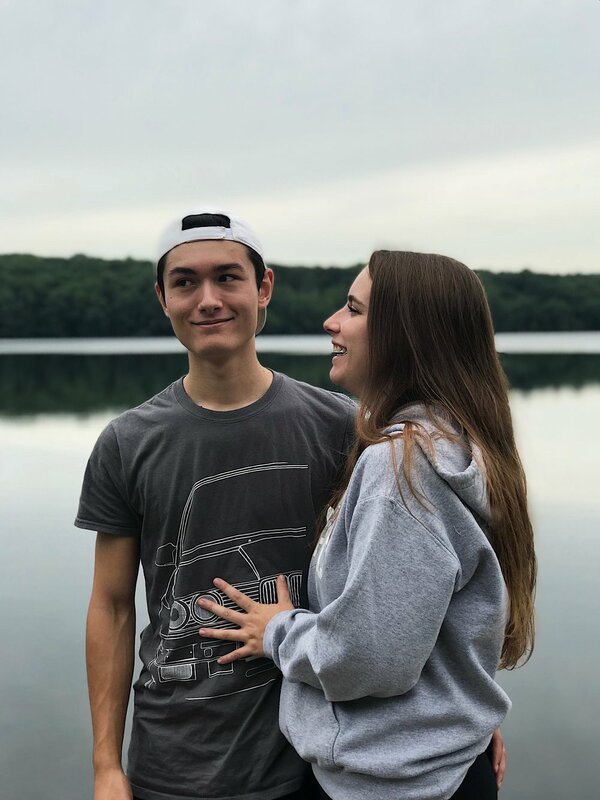 We were reviewing the pictures that we took at the Clinton Road reservoir. 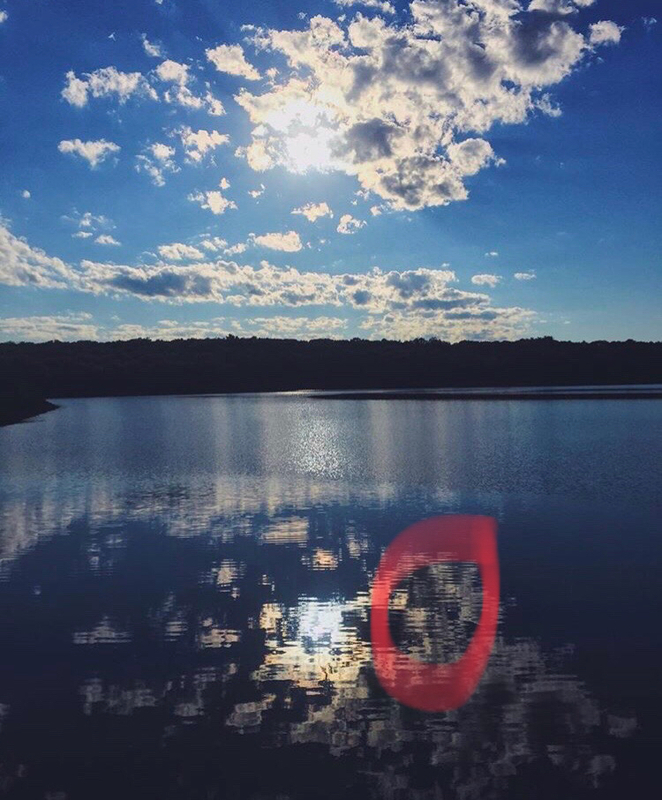 The one picture had a magnificent reflection of the clouds in the water, along with someone. That someone was not us. It was a girl of some kind. I believe that the girl who killed herself in the Camaro showed herself to me because she knew my love for Camaros. I have never been to Clinton Road at night, but I have adventured around there all day and had to drive down Clinton Road after dusk, once or twice. Let me tell you, the feeling that resonates in your stomach is not a pleasant one. It was dark and it felt like everything was going in slow motion. David, my boyfriend, and I were driving back down to Route 23 and out of nowhere we both saw a figure standing on the side of the road. It was strange though; the figure was about average height, but it was so bright. We didn't say anything to each other until right after we passed it. We both looked at each other with wide eyes and said at the same exact time, "You saw that right?" Then without answering each other, we instantly turned around to look if the figure was still there, and it wasn't. Inconveniently we were vlogging for our wanderlust youtube channel, but David stopped filming right before it happened. Let me tell you, whatever we saw that night was not normal, if anything the complete opposite. Another time it was when I was heading home with a friend, it was dark and once again we were driving towards route 23. Out of nowhere, a black pick up appeared in the rear view mirror. We both panicked and agreed back to fly back to 23. The pick-up truck was hot on our tail, but suddenly disappeared as we got close to route 23. I heard the myths of the pick up, but I never believed it to be true until I experienced it myself. Now I am not going to make a map because it is the road itself that draws people to the location. Don't be scared to make some stops and explore the area, but I cannot say this enough... BE CAREFUL, NOT STUPID. Dead Man's Curve: This is the most deadly, tight turn on Clinton Road. Many people have died because of that curve. Little Boy's Bridge: This bridge is right near dead man's curve. Little boy's bridge is the bridge that the little boy still lurks under. Read the myth above labeled "The One That Lives Under the Bridge" for more information. Dam to the Reservoir: The dam to the reservoir is a very interesting location. 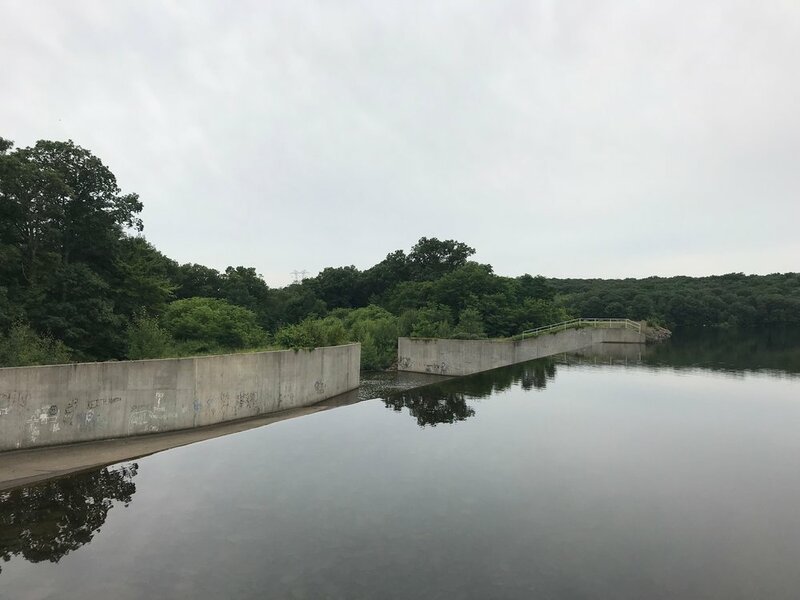 If the reservoir is full you can get some cool pictures on the ledge of the dam. I have never venture past the dam as it is often littered with deep puddles. Read the story above labeled "Figures Running Around Behind Me" for more information. Watershed on Dam: This watershed sits on the dam but is not accessible from the “Dam to Reservoir” location. My friends and I ventured down a background that turns into a dirt road called Schoolhouse Cove Road. When we got to the top of the hill we saw the watershed that was fenced off from the road. We snuck through the busted fence and made our way towards the shed. We peeked in the window and saw a blinking light and lots of levers and switched. We also heard a very faint beeping, which was unexplained. Boat Launch to the Reservoir: The boat launch area has a special place in my heart; as it serves as a good rest stop. It features an amazing few of Clinton Reservoir; it is a good spot skip rocks and just chill out. Clinton Road is not an area to mess with. Most of the myths are true, but all of the experiences I have had they are real. It is a scary place at night and even during the day it will give you chills. If you choose to go to this location I suggest going with a minimum or three people. You WILL lose cell service so, make sure to take screen shots of my map and real maps before entering the area. I also suggest letting other people know that you're there just in case anything bad happens. P.S. All locations are legal unless noted otherwise while at site. Sign up with your email to get the low-down on new adventure spots!